Tindari Greek Theatre is a fascinating archeological site. It includes the excavations of a greek theater and a few old houses which give you a taste of history of Sicily. Although the place is not well-maintained, you can visit this place for the panoramic views offered by it. Standing at the venue, you can see the spectacular island of Milazzo. You can make a quick stop at this place while you are vacationing in Italy. Create a customized plan for your visit using the Patti trip planner. You can use ready templates or start from scratch for the same. Hotels like Monte Alto, Antica Dimora Marinelli, Hotel Corallo CalavÃÃÃ‚ƒÂ and Montalbano Hotel will solve your problem of where to stay in Patti. If you want to add the visit to Tindari Greek Theatre in your trip, you can choose from the variety of Patti vacation packages that can be designed to suit your preferences. These packages also cover your major concern of how to reach Patti. Love this? Explore the entire list of places to visit in Patti before you plan your trip. Fancy a good night's sleep after a tiring day? Check out where to stay in Patti and book an accommodation of your choice. 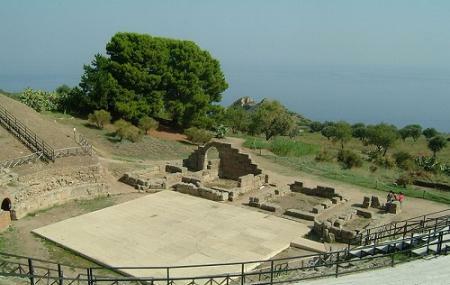 The Greek theatre, which was restored later in Roman times, is situated on a promontory from which there are magnificent views over the Tyrrhenian Sea, the Aeolian islands and the small lakes of Marinello. After years of neglect, today the theatre is the seat of musical shows and theatrical events during summertime. Great setting with a vista of the sea and Aeolian Islands. A fair amount remains, especially from the Roman period, including some impressive mosaics. Much remains to be excavated, the site seems huge. The central Roman section with its red brick pillars is particularly peaceful and evocative. Remarkable feat of engineering and what a strategic position. A surprising lack of signs to guide you to the site and when you got there almost no effort to explain what was there! Beautiful place with lovely sea view. The entrance to the theatre area is a bit pricey in relationship to other locations, but it's obviously going to a good cause. I'm not sure if it's so weedy year around, but when we were there in April it was a bit wild and overgrown. The little museum has some great artefacts. I had never thought about them having glass vessels 2500 years ago!